Perfect time to grab the freshest of fruits and vegetables and make some truly delicious and unique dishes. When trying to decide what kinds of ingredients to use in your kitchen, it can be confusing to know what the right choice is. With words like Organic, Hybrid, GMO, Natural, and Heirloom on every sign, how do you decide what works best for you? 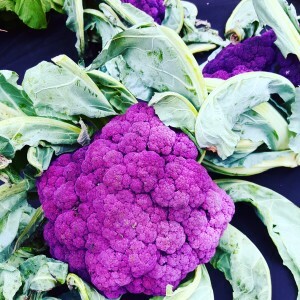 This past week, the CCNYC team went to the Union Square Farmers Market to learn a little more about what makes the best produce during harvest season. There was no contest, Heirloom Fruits & Vegetables are the most recommended and delicious selection around. But what makes a vegetable or fruit heirloom? Generally speaking, it means the seeds are old, at least 50 years. They are in the purest state of the natural plant that we can find today. 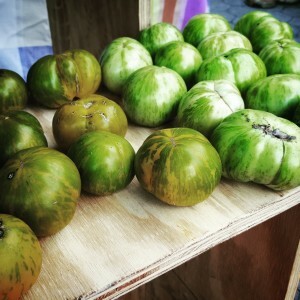 Because of this, there are some guidelines that all farmers must follow to keep their produce in the heirloom family. Such as, the planets can only be pollinated by natural process (insects, the wind, etc.) and must be planted a certain amount a part to make sure their is no possibility of creating hybrids. Because it is a natural process, there is no way to predict what the produce will look like come harvest time. 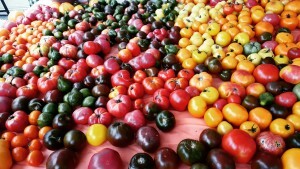 Which is why heirloom’s (especially tomatoes) are a variety of colors, sizes, and textures. These beauties are definitely worth a try, use some Heirloom Fruits & Vegetables in your next home recipe! Seeds are saved from each plant to be used again for the next season, some farms have been using the same seeds since WWII!